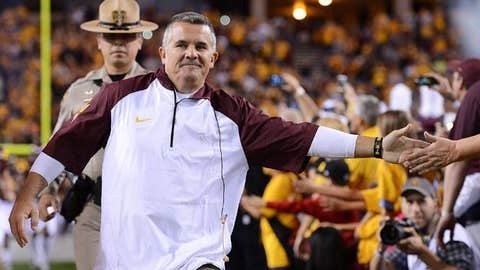 Todd Graham's contract at Arizona State runs through June 2018. TEMPE, Ariz. — Todd Graham reiterated his commitment to Arizona State on Monday amid rumors he could be a candidate for the vacancy at Texas. Graham said Thursday he is focused on ASU and its preparation for the Dec. 30 Holiday Bowl, rather than anything to do with the Texas vacancy. He has been speculated as a possible candidate due to his Texas roots and the fact that new Texas athletic director Steve Patterson was instrumental in hiring Graham at ASU. When Patterson took the Texas job in November, he made an agreement with ASU president Michael Crow not to hire any ASU coaches or staff members. While there are presumably ways around the agreement, Crow has said he would pursue legal action if it were not honored. “Drive” host Jody Oehler asked Graham on Monday if he’s had any contact with anyone from Texas. In September, Graham signed a contract extension through June 30, 2018. The agreement raised his salary to $2.3 million in 2013 and stipulates that if Graham were to terminate the contract to take another coaching position, ASU can collect up to $1.5 million in damages from him. Graham also discussed the status of offensive coordinator Mike Norvell, a seemingly hot commodity on the coaching market. Auburn coach Gus Malzahn tried to lure Norvell away from ASU last season, and while Norvell’s name has not surfaced substantially for any openings this year, he’s likely to attract some attention. “We’re putting together a great situation for him that he can be the No. 2 in command,” Graham said. 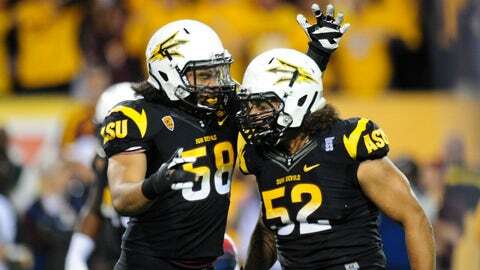 “The only way we’re going to lose him in my opinion is to a head football coaching job, and you want that for him. That’s something I want for all my coaches. Amid Auburn’s interest last season, ASU gave Norvell a significant raise to $502,420, making him the fifth highest paid assistant coach in the Pac-12.